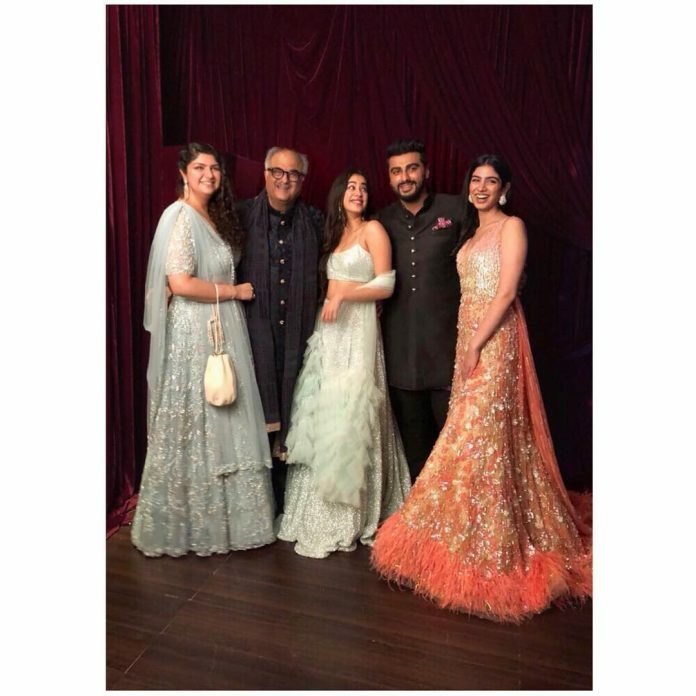 The Kapoor family came together on the occasion of Sonam Kapoor and Anand Ahuja’s big fat Indian wedding. The occasion also brought Boney Kapoor and his children Anshula, Arjun, Janhvi and Khushi bond with each other. The family posed for a beautiful family portrait and Anshula Kapoor shared it on her Instagram account. Boney Kapoor and Arjun Kapoor looked happy and dapper in black outfits while the girls Anshula, Janhvi and Khushi looked gorgeous in Indian outfits and looked cheerful as they posed for the picture. It was a surprise for the fans as Boney Kapoor and his children came in a single frame together to mark one big happy family. On the other hand Sonam Kapoor and Anand Ahuja got married in a traditional wedding ceremony in Mumbai on May 8, 2018 followed by a grand reception in a plush hotel, which was attended by the Who’s Who of Bollywood. Sonam looked gorgeous at the wedding and the reception in designer outfits and Anand complimented well as a groom.